Welded or ribbon rail has been used by the railroads for decades. Maintenance costs are greatly diminished wherever ribbon rail is installed. 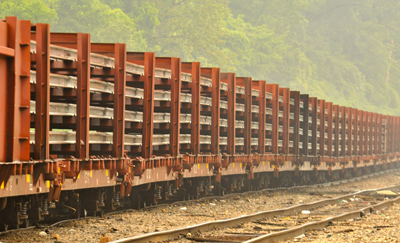 Railroads utilize a multitude of flatcars with racks to transport quarter mile sticks of steel rail. From what I have been able to tell, there is no “one size fits all” when it comes to these unique train sets. There are ribbon rail train sets that have racks that carry 4 levels of rail up to 6 levels of rail. CSX has utilized gondolas with the end of the gondola cut away to carry ribbon rail. Over the last 2 years, I have been able to photograph and measure several types of flatcars with racks. This will allow for the model customer to acquire the equipment that is correct for his railroad. The common length of welded rail is 1440’. Using this information, I had a styrene rail produced for the ribbon rail cars. The rail was delivered here in 17’ sticks. The color of UP Harbor Mist grey was chosen for the rail after placing many colors of test rail on a ribbon rail train on my layout. With the new styrene rail in house, the grey color has proven to be perfect. However, when rail has been weathered, it is even better looking with the grey base color. The rail is extremely flexible. The rail is shipped coiled in a 24”x24”x 4″ diameter box. A test was performed here on 6 sticks of rail coiled in a 24” box. The box set out in the sun day and night for 48 hours. The rail was removed from the box and uncoiled with no negative issues noted. I have built Walthers Proto, Tangent, and Atlas Trainman flats into ribbon rail cars. These 3 brand of flat cars are in stock here at Protoloads. All perform very well in ribbon rail train service. (There are other flatcars on the market that may also be used. Both Intermountain and Bowser have flatcars on the market that may work well for this model project.) Each ribbon rail train set will include 2 tunnel cars and one tie down car in the price of the set. The tunnel car is found at each end of the set and the tie down car is found near the center of the set. The tie down flatcar secures the rail to the rack until the rail is ready to be unloaded along the right of way. Each ribbon rail train set will be a different price depending on the options you choose. 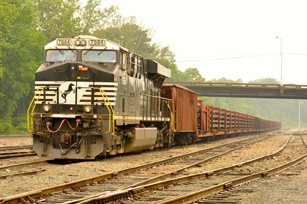 All flatcars have Kadee couplers, air hoses, and brake gear. The Atlas 68’ flatcar is a low end model that dresses up very well for the modern version of ribbon rail cars. 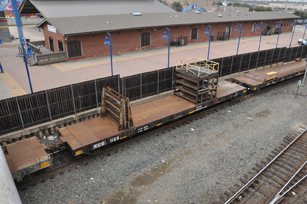 An Atlas Trainman flat ribbon rail train will require 21 flatcars. Half ribbon rail train, 11 flatcars. 21 Atlas Trainman flatcars with No. 5 Kadee couplers, Hi-Tech air hoses, and ratchet brake appliances. A laser cut expanded metal deck, 2 five high racks for each flatcar painted to match the flatcar. Deck equipment for two tunnel flatcars and one tie down flatcar painted and detailed to match the flatcar. 45 sticks of rail, 17’ each or 765′ of rail. 20 custom models boxes for the above models. 11 Atlas Trainman flatcars with No.5 Kadee couplers, Hi-Tech air hoses, and ratchet brake appliances. A laser cut expanded metal deck, 2 five high racks each flatcar painted to match the flatcar. Deck equipment for two tunnel flatcars and one tie down flatcar detailed and painted to match the flatcar. This is also a good model. Grab irons and other details make this model a good starting point. 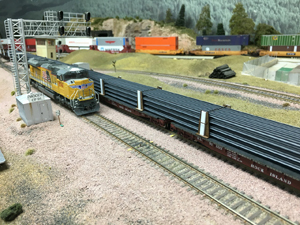 Using the 52’6” Walthers Proto flatcar you will need 26 flatcars to carry a 1440’ rail. Half train, 13 flatcars. This is a great model. Both weight and detail on this model are good. A Tangent flatcar ribbon rail train will require 23 flatcars. Half ribbon rail train, 12 flatcars. If the paint scheme you need is not available, models can be painted and decorated here. Additional details such as AEI tags, ACI plates, etc. can be added as desired. 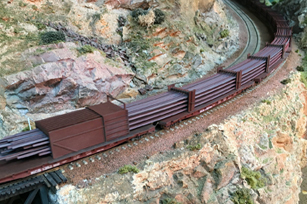 Weathering is available for both the model flatcars/racks as well as the rail itself. Custom decals are available (but may add a few weeks to the delivery). Each flatcar will be placed in a custom foamed lined model box designed by Protoloads to keep your model in perfect condition when not in use. All models are shipped USPS Priority mail. All packages will be insured. UPS and Fedex are not an option in my area. Turn around time will vary depending on the length of the train set and the custom needs of the customer. Racks and rail are in stock at all times. Customer will purchase the flatcars before work will begin on their ribbon rail train set. There are many options available that we can utilized to deliver the customer exactly what they need for their railroad. It is my pleasure to work with you to make this a very successful transaction. The bigger the challenge, the better! If you have any questions, please send me an email at info@protoloads.com.